Dan McCormick combines art, ecology, and engineering to build sculptures that simulate a natural process/feature (ex: beaver dam) of a typical watershed that filters sediment, recharges a floodplain, establishes riparian vegetation/wildlife habitat and promotes general watershed health. When people actively work ~ say, planting willows or spreading seed ~ to restore a landscape, it’s referred to as “active restoration”. 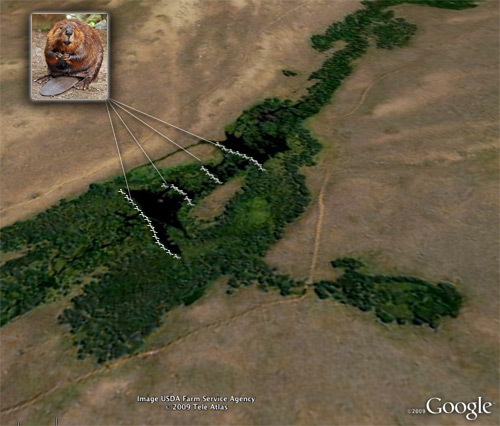 What’s pretty neat is that when the right habitat is present, beaver are hard-wired to perform the same skills of art, engineering, and dedicated work ethic that Dan’s come up with. Beaver dams do all of the things that Dan’s sculptures do – and beaver similarly work up and down a watershed, spreading their restorative affect. When a landscape is left alone to restore itself ~ usually by way of removing human impact ~ and a community of plants and wildlife are given rest to recover, it is referred to as “passive restoration”. Wildlife in the semi-arid to arid (desert) West all depend on water. Because water is limited, the amount of water that remains through a hot, dry summer can largely determine the population and vigor of fish and wildlife. By building dams on tributary streams, beaver help to store water from rain and the previous winter’s snowpack much longer than if the water ran-off uninhibited. Beaver ponds, and especially complexes, provide remarkable sanctuary habitats for fish and wildlife throughout the year. Like Dan mentioned that his sculptures have a positive impact, even downstream from where they are placed, beavers’ positive contribution is felt throughout the watershed as well. It sure is heartening to see some folks doing the right thing.